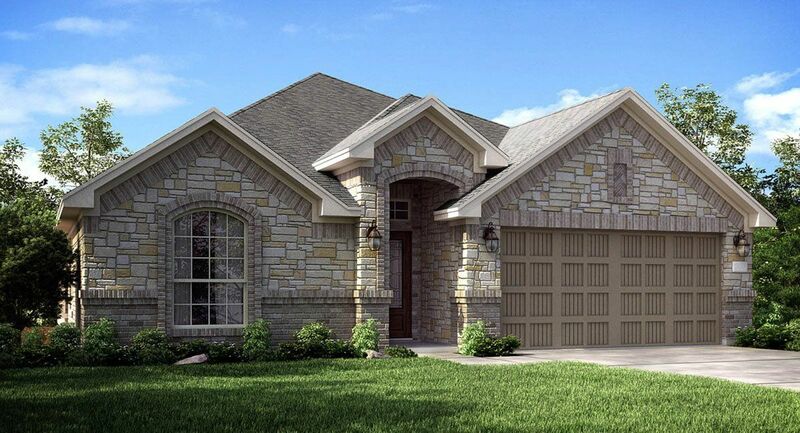 The ample single story Quartz II floor plan by Lennar features an inviting front porch, a spacious entry foyer, a study, dining room, kitchen, a generous family room with access to a relaxing covered rear patio and the option to add a corner fireplace, and a walk-in utility room.. The master bedroom features an en suite bathroom offering dual sinks, private toilet enclosure, shower, and a large walk-in master closet. *The Quartz II floor plan is available for inventory only. A beautifully decorated new Falls at Imperial Oaks: Brookstone Collection, Giallo II model home is NOW OPEN! A second Falls at Imperial Oaks: Brookstone Collection, Emory II model home is now available to tour at 3717 Pinewood Bend Lane! Driving directions to the Falls at Imperial Oaks: Brookstone Collection model home: Take I-45 North to Rayford/Sawdust exit. Turn right on Rayford Rd. and head East for approximately 2.5 miles. Turn left at the light for Aldine Westfield and go 1.5 miles. Turn right on Elan Blvd. Turn left on Birnham Woods Drive. Turn right on Falls Lake Bend. Turn left on Tremont Ridge Lane. Follow to the right onto Pinewood Bend Lane. The model home and Welcome Home Center will be about 350ft. ahead, on the left. Model home and Welcome Home Center address: 3721 Pinewood Bend Lane. Falls at Imperial Oaks is North Houston’s premier Master Planned Community, boasting some of the highest-rated schools in the area, award-winning amenities & features, and superb value. The community is also in an outstanding location, near Spring & The Woodlands, TX, situated within reach of luxury shopping, great restraunts and quality family entertainment. The YMCA of Greater Houston plans to build a state-of-the-art, two-story building near Imperial Promenade Drive and the Grand Parkway, east of Interstate 45. Stay active in 44 acres of Woodson’s Gully, soon to be home to a nature trail system that weaves in out of the forest, crossing creeks and providing a close up view of native plants and wildlife. Sprinkled throughout new home sections are amenity lakes. In Amber Forest, you can find a secluded fishing area bordered with lush vegetation and wooded nature preserves. Our flagship amenity is the gorgeous award-winning lakeside clubhouse. The 4200 sq. ft. facility is ideal for year-round family fun at private and community events. The Falls at Imperial Oaks pool area offers fun for residents of all ages. Dive in to our refreshing Junior Olympic pool with swimming lanes. Inside our Lake Club, you'll find a fully equipped fitness center. You'll have access to top-of-the-line treadmills, bikes, weights and weight machines. The natural beauty of Falls at Imperial Oaks is reinforced by the miles of walking and greenbelt trails woven throughout the community. Among the several pocket parks Falls at Imperial Oaks is home to, none are more beloved by our four-legged residents than the dog park. © 2017, Falls at Imperial Oaks. All Rights Reserved.